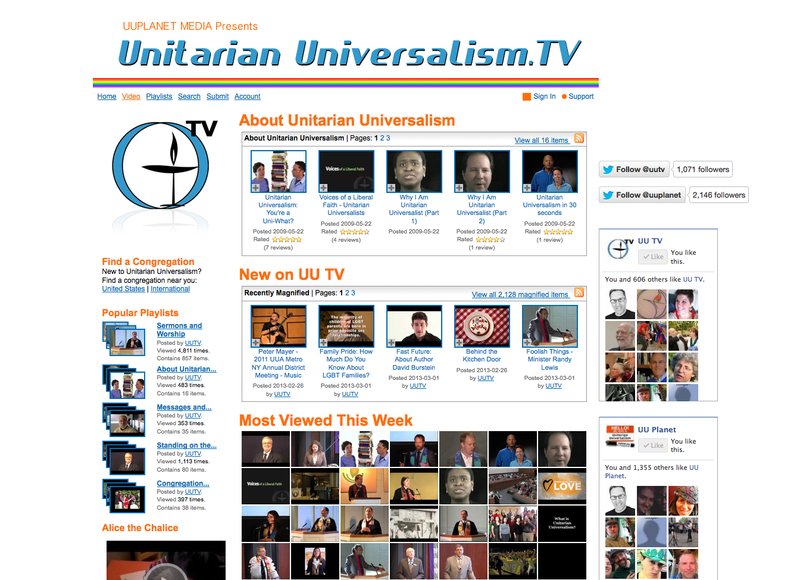 Screenshot of the UU TV website. For years I maintained the UU TV website which featured at its peak around 2,000 Unitarian Universalist videos. This was a video aggregator site that made it easy for newcomers to explore our faith. After the launch of Facebook the need for the site declined. Plus my review showed that over 95% of the video views were of the same “About Unitarian Universalism” videos including the UUA’s Voices of a Liberal Faith and my You’re a Uni-What? video. These top videos have been added to this playlist, which you are welcome to use and share. So, thanks to social media I decided to retire the site. It is important that we experiment AND to know when an experiment or other project is no longer valuable. Peter, no apologies! Times change, and like a good UU should, you’ve adapted. You’ve singlehandedly done more to promote Unitarian Universalism in the past ten years than any other person or organization, and you’ve inspired me to try to do my small part in my corner of the world. Thank you for all of your guidance and efforts. Hey Peter I was wondering if you still make productions for your UU congregation I would love to do aUU 101 show. I see you have a YouTube channel under your name with UU community events is this your own site or does the church help you with costs? Hi Patrick, Just catching up after the holidays. The UUPLANET youtube channel is 100% mine. A range of videos, some paid projects some not. I have done some videos for my wifes congregation, though that was a while back.